InsideOut Solutions is proud to announce the November 10 launch of a new responsive bed & breakfast website for Federal House Inn – a luxury Berkshires B&B located in Lee, Massachusetts. BEFORE: An increasingly difficult website to maintain. Previous owners Kolleen & Brian Weinrich began looking for new a new website host in 2013. Fellow innkeepers of a nearby B&B referred Kolleen & Brian to InsideOut Solutions and hosting of the Federal House Inn website was transferred in June of that year. The website, though built in WordPress, used an older template theme that proved problematic with maintenance, updates, and upgrades. Even so, InsideOut was able to make a series of improvements, such as a mobile-friendly version of the website, speedier loading, social sharing buttons, and SEO. 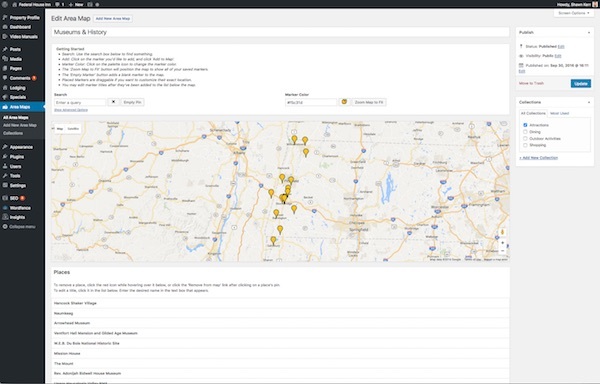 By 2015, however, continued improvements on the old theme became cost-prohibitive and we recommended a redesign. 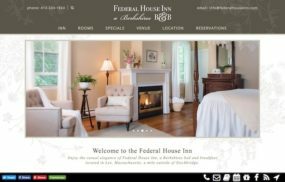 New Federal House Inn owners/innkeepers Marsha & Ken Anderson worked on making the B&B their own while InsideOut Solutions worked on making the website meet their vision. Kolleen & Brian sold the Federal House Inn to Marsha & Ken Anderson in April of 2016. InsideOut Solutions assisted with the transfer by providing an outgoing owner checklist to Kolleen & Brian and WordPress training and technical support to Marsha & Ken. 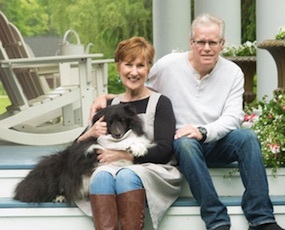 Shortly after settling in as the new owners, Marsha & Ken were ready to move ahead with re-branding their Berkshires bed and breakfast and contacted Patricia McCauley to discuss what InsideOut could do to help. Pat and the web team reviewed the current internet marketing efforts and effectiveness of the inn. The resulting proposal to Marsha & Ken was for a new custom WordPress website that would not only give it an all new look and feel, but would also make sure it looked its best on all devices, load speedily, and keep both visitors and Google happy. The first step toward re-branding was a redesign of the logo to reflect the inn-keeping style of the new owners. Lead web designer Beth Edwards worked with Marsha to come up with a fresh design that would encapsulate the innkeepers’ style and appeal to a wider audience than the more conservative look of the previous logo. The previous Federal House Inn logo was stately, but not in line with the new owners innkeeping style. The new Federal House Inn logo adds just enough casualness to match the B&B experience Marsha & Ken provide to their guests. With the logo approved, Beth went to work designing the layout “look & feel” for the website based on Marsha & Ken’s responses to a website questionnaire. Beth knew from the responses that the innkeepers were looking for a website look that is a simple, yet elegant meeting of French country and industrial styles. Her proofs to the client also kept the color scheme and design elements subdued to allow the photographs to really “pop” on the page. While Taylor worked on creating the custom WordPress theme, plugins and post types for Federal House Inn’s responsive bed & breakfast website design, Beth worked with Marcia on the content it would contain. New photos were optimized for display on the website and the text was rewritten in the new owners’ marketing voice. Beth was able to fill in the pages using these new materials once the design was ready. From there, it went to Shawn for pre-launch Search Engine Optimization (SEO) work on page content and “behind the scenes” code that were applied via page edits and the Yoast SEO plugin during the proofing process. Redirects were created for all URLs of the previous website to ensure no “page not found” errors would show up to have a negative impact on either search engines or visitor experience when the new website launched on November 10. AFTER: a custom responsive bed & breakfast website design that matches the new owners’ innkeeping style. 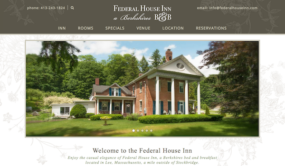 Following the launch of the new Federal House Inn website, Shawn also performed post-launch SEO to give it speedy and complete indexing in the search engines. 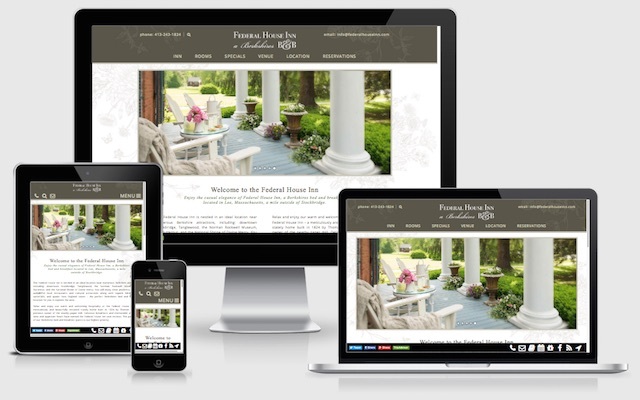 Considering a Responsive Bed & Breakfast Website Design for Your Inn? If you have a WordPress website designed by InsideOut Solutions that’s four or less years old we can provide you with a cost-saving responsive upgrade. Custom WordPress websites developed by us that are over four years old will typically require a full responsive redesign. Don’t have a WordPress website? We’ll build you a custom responsive bed & breakfast website design in WordPress. Contact us today for a quote to move your internet marketing forward.